We stopped to think of all this, and then took our way up the sharp ascent, which soon brought us to the wide Piazza at Fiesole the heart of that old Etruscan stronghold the neighbour and constant foe of Florence. The Piazza itself shows an extraordinary mixture of stateliness and squalor in its buildings, and is usually peopled by a strange medley of countryfolk and of tourists of all nations. We disentangled ourselves from the crowd of beggars and sellers of straw hats, fans, and what not, and looked about for a peaceful spot in which to rest. We could think of nothing more pleasant and attractive to mind and body than the terrace of the Aurora Hotel, where we chose a shady table with a lovely view, and were prosaic enough to order our much-needed colazione. Meanwhile, we sat and gazed at the exquisite scene spread out before us. 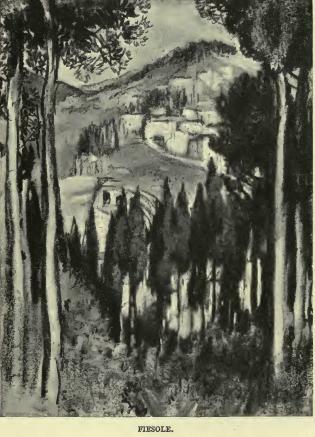 Far below, in a soft mist, layFlorence; the great dome of the Cathedral and the towers of the city showing above an unobtrusive mass of roof, and peeping behind the olives and other trees that veiled the steep slope. Across the valley San Miniato rose with the lines of hills behind it. Italian scenery, at any rate in Tuscany and Umbria, has a curious elusive charm; it does not rise up and proclaim itself picturesque; the lines of colours melt and flow without violent contrasts and sharp contours, and there is everywhere just that touch of austerity which enhances the beauty. The most assertive thing are the cypresses, pointed and uncompromising in their outline, though the effect they make is never hard, as they always seem to be of a lovely shadow-colour. Noon is possibly never quite the most beautiful moment for a landscape, but the day had a touch of blue mistiness that mellowed the light and gave an added colour to the shadows.